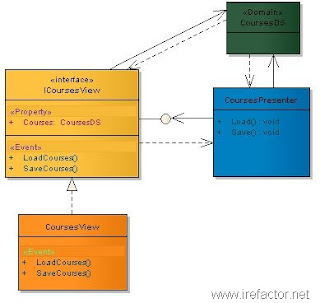 This is a third post in the series of posts about “Separate Domain from Presentation” Refactoring. Last time we explained how to refactor towards MVP – Supervising Controller pattern. In this post I will complete the required refactoring steps and will suggest more steps to even deepen the separation of UI and BL concerns. 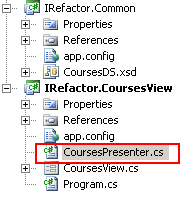 "Extract Interface" – in order to have a better encapsulation and separation of concerns, the CoursesPresenter shouldn’t access CoursesView directly. After all, the only functionality of interest to the CoursesPresenter is the CoursesView Courses property. 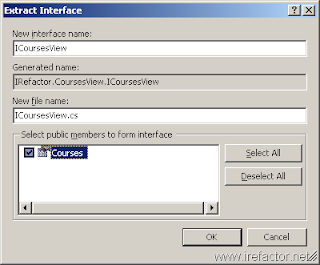 Therefore, we will extract an interface from CoursesView class as follows: right click on the CoursesView class » Refactor » Extract Interface and select Courses property as shown in the figure below. 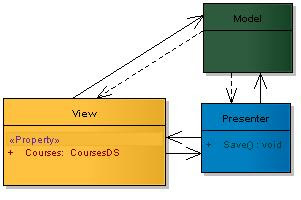 In the CoursesPresenter class change all the occurrences of CoursesView to ICoursesView. In the CoursesPresenter class rename the Load and Save methods to LoadCoursesEventHandler and SaveCoursesEventHandler respectively. Use right click » Refactor » Rename tool to rename it easily. 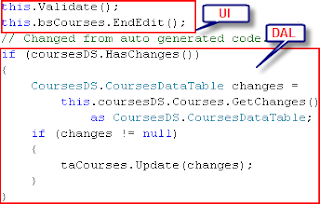 Now it is the time to remove all the temporary instantiations of the CoursesPresenter class in the Load and Save methods. Remove all the occurrences. This concludes the “Separate Domain from Presentation” refactoring. Go over the CoursesView.Designer.cs and remove all the TableAdapter instances. Create DAL and move Save and Load methods further more, from the presenter to the DAL. 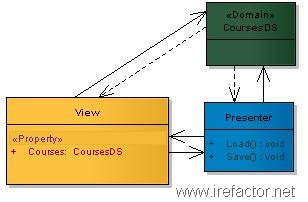 Create the CoursesView and CoursesPresenter using Abstract Factory or using Dependency Injection. Here is a scoop; The good software engineer is lazy! Reuse a function instead of duplicating its code? Explicitly name a function for its behavior instead of naming a function F1 and providing a non descriptive (and possibly long) documentation? Yet, here is another scoop; The bad software engineer is lazy too! The difference is that a good software engineer is lazy in a constructive way (which allows to build reusable software and automated processes) while a bad software engineer is lazy in a destructive way (which destroys any chance for a reusable software and dooms you for long hours of struggling to understand and fix the bad code). The var keyword allows implicitly typed variable declaration. To tell the truth, it doesn’t allow to be a bad lazy software engineer! What is the meaning (meaning = type) of the database object in this context? Do I really need to guess that? Does somebody expect me to go to its definition to find out? What is the meaning of the observingStore object in this context? Was it named observingStore due to its implementation of the Observer pattern (which implements IObserver), or is it just an object name of a Store, ObserverStore or even ArgicultureStore class type? Remember, you want to be lazy in a constructive way; You want to read those lines of code without wondering. You want to immediately grasp the meaning (types) of the objects you are dealing with, without switching the context and jumping to a different location just to refresh your memory. The var keyword was introduced for one and one purpose only; To allow usage of anonymous types. Therefore, this is the only place you should use it! Unless you are a bad lazy software engineer (which clearly is not the case :) ) you will follow the rule! The Scientist Office provides support to Israeli hi-tech companies in the field of innovative research and development (R&D). A month ago we applied for such a support and I was advised (thanks to Avi) to summarize the experience for those who might be interested in the future. Here is a short list of Don’ts and Dos from the technology perspective. All the information is freely available here. The application forms are easy to follow and easy to understand. Using an external consultant only adds complexity, sometimes due to his eagerness to “contribute” to the process. What are the key points of the current technology (if exists any). Why the current technology (or current market’s technology) doesn’t work for the required problem. How your technology innovative development will address the required problem. Here you can broaden your key points and explain in more details what the technology steps you will apply. Any algorithmic or technology innovative solutions must be described in a high to mid level (All the Scientist Office’s inspectors should keep confidentiality). 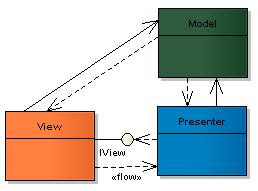 Do provide a Block Diagram (possibly Component Diagram in UML) that describes in a high level the architecture of your future product. Provide a short description for each component and emphasize the innovation in each component if exists. Don’t break down the tasks to Design, QA or DB support. It’s obscure. Incorporate those inside the tasks themselves. If you have a task that spans over 2 years (2-year application), divide the task by meaningful milestones. Chief Scientist supports only development; don’t provide any production costs. Chief Scientist supports one computer per R&D team member. Chief Scientist encourages the use of local sub-contractors during the development phase. To explain why your technology is needed. To justify the feasibility of your solution; Show you have enough resources (or that you plan on hiring them) and demonstrate any technological proof of concept. To justify any development cost or use of a sub-contractor. I hope that this short list helps you, but if you still have questions you are most welcome to write me and I’ll gladly try to assist.